Sally Fitzgibbons is an Australian professional surfer on the Association of Surfing Professionals World Tour (2009 – 2013). She was born in Gerroa, NSW Australia. Sally started surfing around six years old, but surfing wasn’t the only sport she was enthusiastic about. She represented her State and Australia on 14 occasions in a number of different sports, including athletics – winning gold at the (2007 Australian Youth Olympic Festival) 800m and 1500m – touch football, soccer, surfing and cross-country running, while attending Kiama High School. 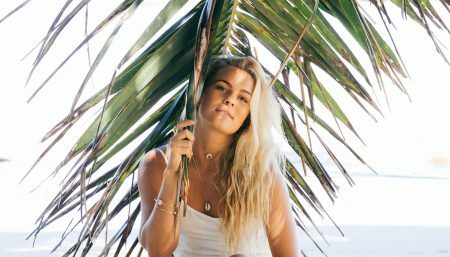 As a surfer, Sally had her first significant results at the age of 14, becoming the youngest surfer to win an ASP Pro Junior (Under 21’s) event, also finishing second at the World Qualifying Series (WQS) Billabong Easter Girls Festival on the same day. She continued to set records throughout her junior years, winning the Australasian Pro Junior Series in 2007 and again in 2008. At 15, Sally represented Australia at the International Surfing Association (ISA) U18 World Surfing Titles in Brazil placing second; at 16, she traveled to Portugal for the ISA U18 World Titles to win her first World Title and backed it up the following year winning both the Billabong ASP U21 World Title and the ISA World Games Open Title. In her first attempt to reach the Women’s elite World Surfing Tour via the World Qualifying Series, Sally set a record by wrapping up the 2008 WQS series in the first five events, becoming the youngest World Surfing Tour qualifier in ASP history. 2009 saw Sally finish fifth on the World Surfing Tour in her rookie year, with a win at the Portugal WQS event along the way. In 2010 Sally was runner up in three ASP Women’s World Tour events, and finished the year as runner up to Stephanie Gilmore in the 2010 ASP Women’s World Title. On 23 April 2011, Sally won her first ASP World Tour event, defeating Carissa Moore in the final of the 50th Anniversary Rip Curl Pro at Bells Beach to ring the Bell and announce her arrival as genuine world title contender. A week later Sally went back-to-back, winning her second ASP World Tour event at the Subaru Pro in Taranaki, New Zealand, once again defeating Carissa Moore in the final. With this win Sally took the lead in the 2011 ASP World Tour rankings. In August 2011, Sally won her third ASP World Tour event, defeating Lakey Peterson in the final of the US Open of Surf in California, USA. Sally finished the season runner up to Carissa Moore, in the 2011 ASP Women’s World Title. Sally also won the 6-Star event Swatch Girls Pro France in 2011. In February, 2012, Sally won the first ever Australian Open after defeating 2004 World Champion Sofia Mulanovich. In the process Sally became the first person to hold the US and Australian Open titles at the same time. At the 2012 ASP World Surfing Awards Sally claimed three trophies. The first was for finishing runner-up in the 2011 World Tour. Sally’s second award was for Women’s ASP Heat of the Year, which was awarded to Sally and Carissa Moore by their fellow competitors. Finally Sally won the ASP Surfers’ Surfer, another peer-voted award. In March 2012 Sally won the 6-star event, the Hunter Ports Women’s Classic during Surfest at Merewether Beach, Newcastle, Australia. Sally defeated Malia Manuel in the final. In April Sally took out the Rip Curl Pro at Bells Beach, Australia, beating four-time world champion Stephanie Gilmore in the final. This meant back-to-back wins at Bells for Sally. May saw Sally win the Billabong Rio Pro in Brazil. Sally came up against Coco Ho in the final and victory took her World Tour event win tally to five, and also gave her a runner-up world title finish for the third consecutive year, an achievement she is truly proud of. In the first event of 2013 Sally finished runner-up at the Roxy Pro in Queensland Aust. Sally made the final in Rio de Janeiro once more in May, but again finished runner-up. Heading in to the final European leg of the tour the world title was just out of Sally’s grasp, but she set herself the goal to send a message that she was going to be ready for 2014. With a win at the Roxy Pro in France, and a runner-up to new world champ Carissa Moore in Portugal, Sally finished third in the world, with the highest average heat scores for the year, and did exactly what she wanted to. Behind The Smile, Sally’s biopic, has just been released, showcasing the last year in Sal’s life and showing what will be required to fulfil her dream of one day becoming World Champion. As well as her title hopes Sally’s desire to travel the world and be the best athlete she can be remains as strong as ever… bring on 2014!